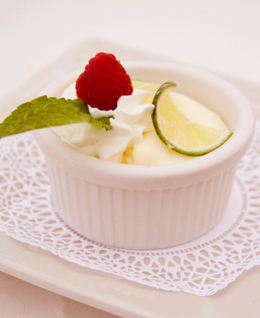 You can make a “pot de crème” in a standard ramekin. Photo by Kristen Johansen | IST. The recipe will fill six half-cup pots de crème, panna cotta dishes or ramekins. The ingredients are the same as for the Key lime pie, minus the crust. *The original Key Lime Pie was made with sweetened condensed milk. In the Florida keys, there were no dairy farms; and before modern refrigerated shipping, no fresh milk or cream. So sweetened condensed milk was used instead. The particular flavor it imparts is a signature of Key Lime Pie. The directions are essentially the same for the pie filling. MIX the filling in a bowl with a pouring lip, or else pour the filling into a large measuring cup with a lip. This will help you fill the pots de crème or ramekins easily. DISTRIBUTE the filling among the pots or ramekins and place them in a large baking dish. Fill the dish with hot water to within ½ inch of the top of the pots. Cover the dish with aluminum foil and bake until the custard is set in the center, approximately 15 minutes. Do not overbake. REMOVE the dish from the oven and carefully remove pots—do not splash water into the custard. If you are using pots de crème, it helps to put the lids on before removing them; if you are using ramekins, cover them with plastic wrap. REFRIGERATE until the custard is fully set, 3 to 4 hours or overnight. GARNISH with a sprinkle of graham cracker crumbs, or serve with a side of graham crackers (look for a gourmet variety at Whole Foods, Trader Joe’s or a specialty food store ). You’ll have a “deconstructed” Key lime pie.